Diwali is nearing by and I see all blogs are flooded with various sweets and savouries recipes.As I mentioned earlier I would be posting few recipes for Diwali as I was fortunate enough to click few pics in the last year when I had spent quality time with my parents during my pregnancy and post natal care. My mom preferred to give me home made sweets, snacks and savouries during that time. Though I could not capture all the food items my mom prepared through my camera,I somehow managed to click few items which I am sharing happily with you people now. This Moong dal Murukku was one of those recipes she prepared for me. 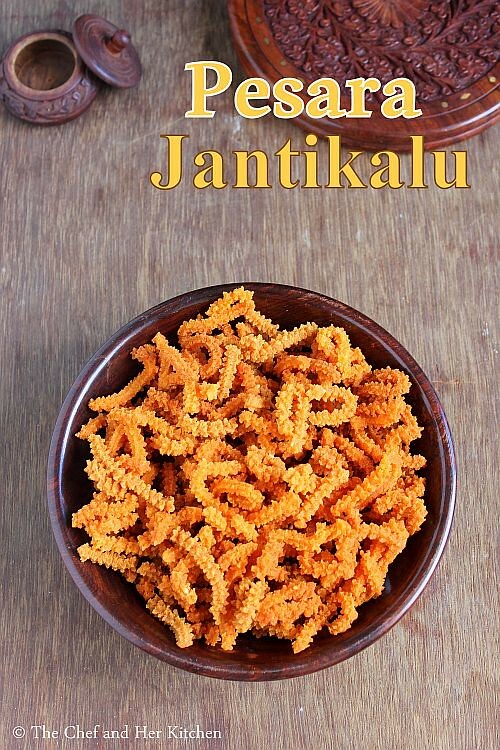 'Pesarappu Jantikalu' aka 'Moong Dal Murukku' is more popular in Andhra when compared to the other South Indian states.The preparation process of this moong dal murukku is similar to Manugupoolu(Mullu Murukku) but we have added moong dal in addition to the other ingredients used to prepare Mullu Murukku. 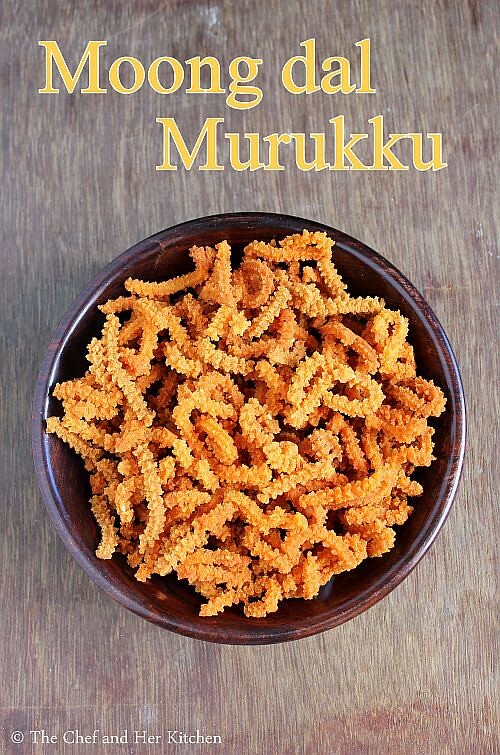 The taste of the moong dal murukku is significantly different when compared to the Mullu Murukku.Also this murukku has got lovely golden brown color because of the addition of moong dal. 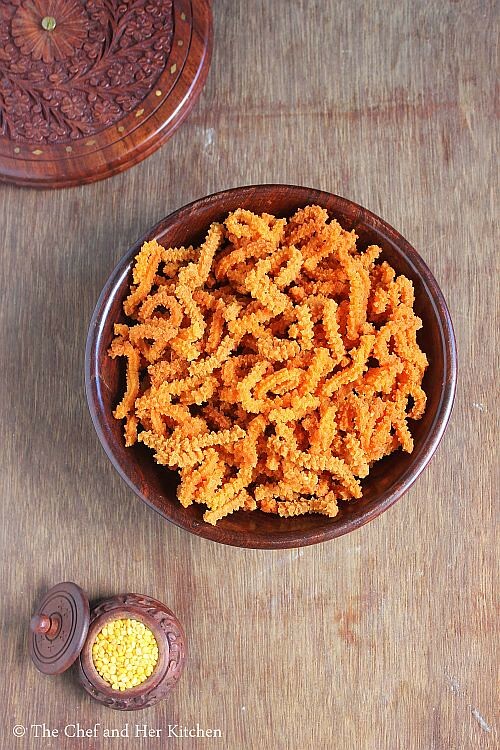 Try this crunchy and tasty moong dal murukku for Diwali and I am sure you will hook to it. Dry roast moong dal until slight red in color and let it cool.Slightly warm the fried gram in the same kadai for a minute,do not roast it. Grind raw rice,roasted moong dal and fried gram into a fine powder.You can get it done from a mill if you are doing in a large quantity.If you are grinding it at home make sure you grind it to a fine powder and sieve it to remove any rawa residual in the flour. Now measure the quantity of flour.Take equal quantity of water and boil it,reserve some water(2 cups) and use it later if necessary to bind the dough. In a big bowl take the flour and add carom seeds, salt and red chili powder and mix well. Add butter and the rice flour mixture to the boiled water and stir it immediately and remove from fire.If you find it dry add more water(reserved hot water) and mix until you get a thick dough.Leave it aside for 5 mins until you can handle the mixture with hands. 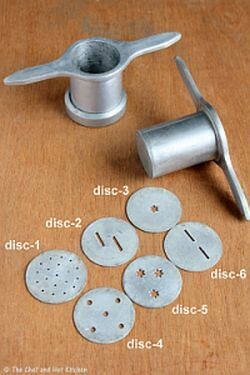 Meanwhile heat oil in a kadai to deep fry murukkus..
Use the 3 hole star disc (disc-5 in the image above)in the murukku maker and fill the dough in it.You can even use disc-4 to prepare this murukku. Press the murukkus in a circular motion in the hot oil carefully.Do not bother even if it breaks and also try not to over crowd the murukku in the oil. Deep fry over MEDIUM to HIGH flame until the bubbles vanish in the oil.Drain on to a colander to remove excess oil.Repeat the same process with all the dough. Let the murukkus come to room temperature and store them in air tight container. 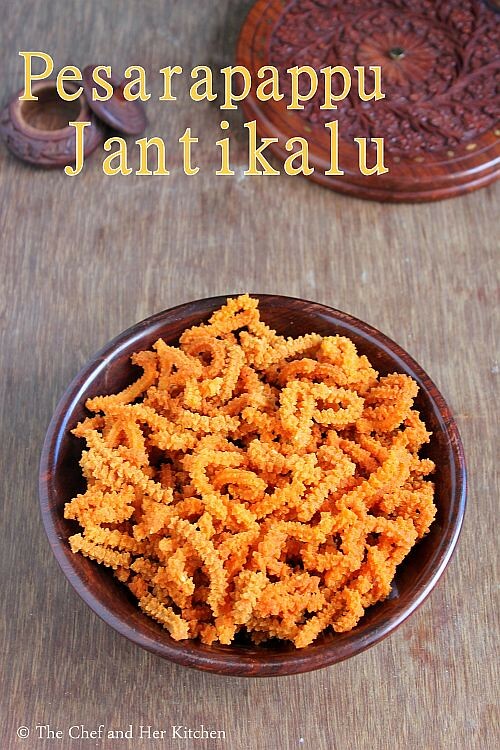 You can serve them along with tea or munch when ever you want. If the murukku turns very hard to bite,it means the amount of hot oil you added to the dough is not enough.Add 1-2 tbsp more and make the next batch. 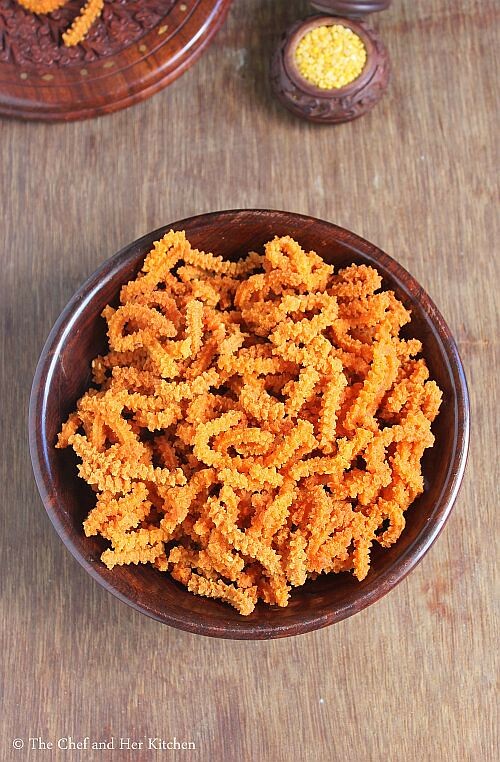 The murukkus will be slightly reddish in color when they are fried but they reduce the color by next day and almost turn slightly brown. I am a huge fan of urs!!! I regularly visit your website for huge variety of dishes! I am also Arya Vysya. Any idea about Pesara kadiyalu which is famous among our community. Can you please post the recipe for it.